For safety reasons, the keys to your Exodus wallet are stored in a location on your computer that is separate from the wallet program's data. This design decision allows users to upgrade easily, and makes it difficult for new users to accidentally remove those important files from their computer. If you would like to uninstall Exodus, or erase your wallet and start over, you can follow these steps. WARNING: THESE STEPS BELOW WILL REMOVE YOUR DIGITAL ASSETS FROM YOUR COMPUTER AND THEY CANNOT BE RECOVERED WITHOUT A BACKUP. BE SURE YOU HAVE SENT ALL OF YOUR ASSETS OUT OF YOUR WALLET OR HAVE A COMPLETE BACKUP BEFORE CONTINUING. 2. Remove the following folder containing your digital asset keys and wallet data on your computer. The data directory is located in different places depending on if you are on a PC, Mac or Linux. 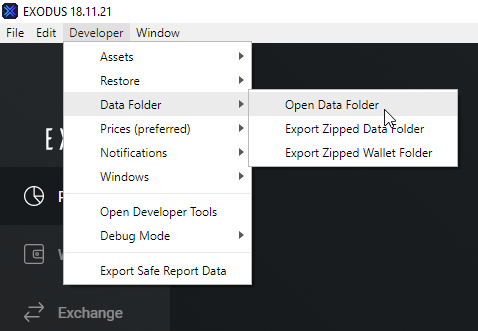 You can also access the folder from the Exodus wallet by opening the developer menu and following this path: Developer > Data Folder > Open Data Folder. Windows users may need to show hidden files to access this folder. Here's how to open the developer menu. Close the wallet before removing the files. Once this folder is removed, opening Exodus should lead straight to the portfolio page and there will be no funds in there. 4. Launch Exodus and you will now have a brand new wallet. This wallet has new private keys and a new 12-word phrase, so if you begin to use this new wallet, be sure that you complete the backup process again because you will have a new 12-word recovery phrase. If you deleted your wallet to secure it from a hack or phishing theft, you're now secure and ready to send any remaining funds back into Exodus.